Click here to get your free copy of the first chapter of the book. While the most feared diseases of the 19th and early 20th century have been virtually vanquished by modern medical technologies; science alone appears to be no match for the current health crisis caused by the habits of the 21stcentury lifestyle. Think about it: overconsumption, processed foods, sedentary lifestyles, inadequate sleep, increased stress and environmental toxins have led us to a new array of sensitivities, syndromes, and metabolic phenomena unknown to previous generations. If poor lifestyle decisions can cause this much damage, is it possible that positive lifestyle decisions are the key to resisting chronic diseases, or eradicating them altogether? 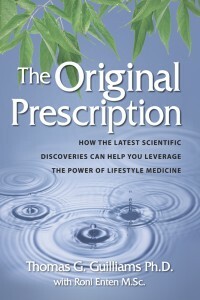 The Original Prescription reveals the fascinating science behind lifestyle medicine and demonstrates how our everyday choices can alter the signals that drive our health. Medical solutions should work with our body, not impose an outcome upon it. The Original Prescription is that solution, one that our bodies are waiting for us to fulfill.